We have a Rocky Cherry sighting! Wade Miller has gone on the DL (thank Christ) and Rocky Cherry has been called up for his cup of coffee. I haven't been this pumped up and sexually aroused by a Cub pitcher since I caught my first glimpse of a shirtless Kyle Farnsworth. Hopefully Cherry has as good of a right hook at Kyle did. I'll go on the record and proclaim Cherry as the boost the Cubs need. The bullpen is in a sorry state and something needs to be done about it. 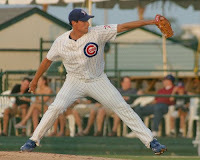 Oh yeah, and Mark Prior is going under the knife Tuesday. Who's Mark Prior you ask? Some guy. Just some guy.